It’s the latest Albert the Alien and – what the heck is going on here!?! Clearly Albert has also become a victim of the locker thief, with all of his alien gadgets having gone missing! His locker is empty, except for a handful of wires that were used to power the TD3. The problem with having all of your stuff in another dimension is it’s very easy to steal – they just have to take the device used to access them. Now sure that the world is going to end, Col Ty Fighter heads straight to the roof of the building to consult his scientists on the best way to stop this imminent disaster. If you or someone you know would like to appear in a future episode of Albert the Alien, we do sponsorships all the time. Currently this story arc (issues 3 and 4) are all booked up, but we’ll be doing more appearances again soon – so be sure to keep an eye out for them! 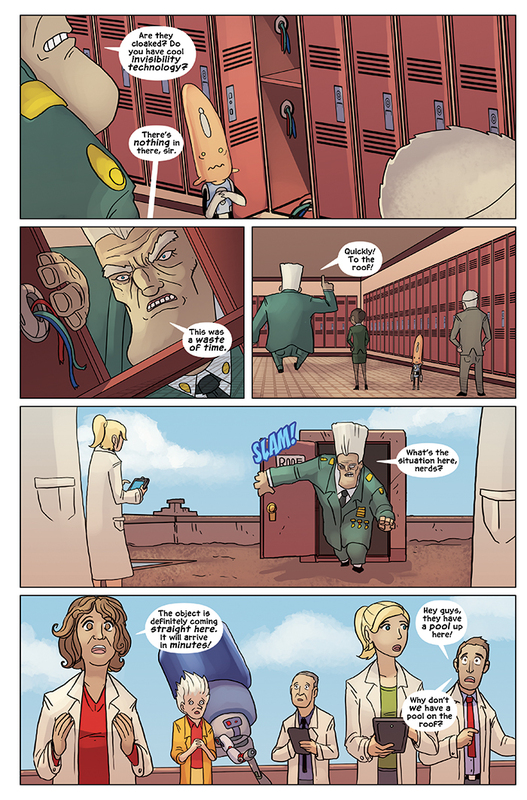 So how will Albert and the gang try to save the world and find where his missing items from his locker went? Tune in on Friday for the next thrilling installment of Albert the Alien! This week is my final convention of the year, Con Alt Del. Both Gabe and myself will be guests at this show, which promises (like all of our appearances) to be a fun time! We’ll both be doing some panels at the show and selling our art and comics, so we hope to see you there!